The Youngstown State volleyball team has three new faces on its team this season, and head coach Mark Hardaway is hopeful that each will make a meaningful contribution on the court. 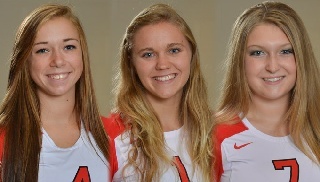 Freshmen Dana Borsz and Halle Oatridge are both defensive specialists, and sophomore Jessie Gerig is a setter. Borsz earned four letters as an outside hitter at North Olmsted High. She led the Eagles in digs in each of her final two seasons and had team-high honors in kills as a senior. A four-year starter on the varsity squad, Borsz earned First-Team All-Southwestern Conference and first-team all-district honors during her career. Oatridge is a graduate of nearby Mathews High School, earning three letters for the Mustangs. As the libero, Oatridge led the team in digs and aces in each of her final two years and set a school record with 449 digs her final year. She registered an impressive 92 aces as a junior. She was named All-Northeast Athletic Conference and all-district twice. Gerig is a graduate of Normal Community High in Illinois who played last season at Broward College in Florida. As a college freshman, Gerig averaged 7.43 assists, 2.34 digs and 1.19 kills per set. She was a three-year letterwinner in high school and earned team MVP honors her senior year. Gerig's sister Nicki played volleyball at Auburn and Florida Atlantic, and her other sister Jackie is currently a senior on the LSU volleyball team.